Did you participate in last week’s discussion on what it takes to be successful at blogging? Have you checked your New Year’s goals lately? I wanted to start by thanking everyone who participated in last week’s discussion on What it Takes to be Successful at Blogging. We received such great feedback, and you all are so inspiring. We heard everything from Google search words to the writer’s personality. I think that the answer is probably a combination of everything that you said. Like a recipe, a little personality here, a dash of the easy to read factor, add a witty headline, and sprinkle of humor. Mix in a bowl of informative content, let rise then bake. Before serving, drizzle Google search words and there you have it- a successful blog post. Uh oh, do you remember when 2013 started? 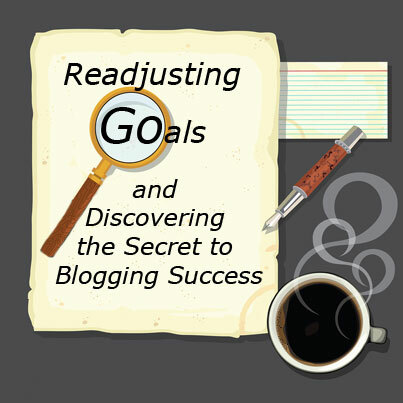 We were all filled with hope and excitement on how we would accomplish our blogging goals. Well, I wanted to check in with you all because, well, I need a little kick in the pants. In How to Set Blogging Goals and Achieve Them, I, with the best of intentions made the goal to be 2 weeks ahead in all my blogs. Let me repeat that, with the best of intentions. I repeat it because I think it is importance to give myself a break. I really thought I could do it, and I need to remember that it is okay that I need to readjust. So, obviously, I haven’t achieved my goal. With March right around the corner, it is the perfect time to examine my goals and readjust. While two weeks was a bit more than I could handle, I was able to accomplish 1 week. My 2 week goal just wasn’t working for me. Some of my articles are time sensitive and well I’ll be honest, life happens. What my goal was missing was that it was not achievable like I thought it was. For me, it is important to acknowledge that it is okay that I did not achieve my original goal. Not only is it okay, but it is good. When we put unrealistic expectations on ourselves it just causes more stress than we need. So, if you are like me and sometimes you set unrealistic goals and expectations for yourself, give yourself permission to adjust and let go of that expectation. Did you set a goal that maybe needs readjustment? Or, have you achieved your goal and need to give yourself a pat on the back? I would love to hear all about it, so please make sure to comment below. It IS hard to believe we are in the third month of 2013 already. So far, I’m about where I’d hoped, but yeah, when your self-imposed goals are weighing you down instead of moving you forward, it is time to readjust! Great job on your goals and thanks for commenting! Thanks for these regular nudges to keep me moving along in my blog development! I read them and get inspired to keep on keeping on! Hi Christine – I am always changing my goals but hey, it makes life interesting. For me, writing flows when I don’t plan it rigidly. As long as I am consistent and give attention to all my tasks frequently, I accomplish most of what I want to do. How many blogs do you have? I ghost write for 2 different blogs and once a week I write for R & R Web Design’s blog. I’m so glad I’m not the only one who needs to change their goals every once and a while. 🙂 Thanks for the comment.